Mercantile Bank Head of Card Division Abu Sakin and Gulshan North Club Director Khondkar Anisur Rahman exchange documents after signing an agreement on ATM booth at Gulshan Club in the capital on Friday. Mercantile Bank Limited and Gulshan North Club signed an agreement on Gulshan club premises in the capital on Friday. 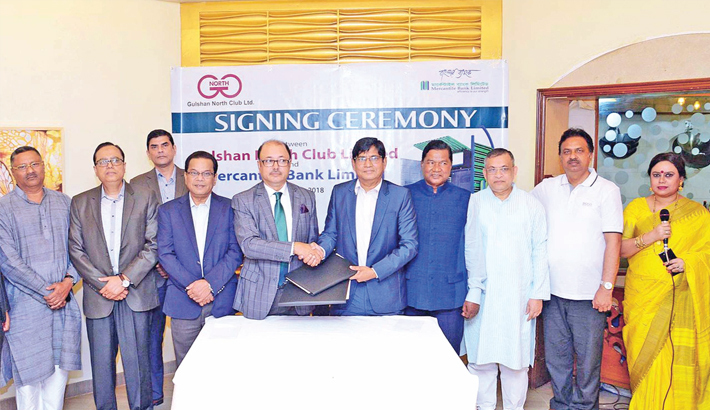 Under the agreement Mercantile Bank will install an ATM booth on Gulshan North Club premises for giving ATM services to the members of the club, said a press release.